References BoxLayoutData< T >::allocateGhostVector(), MayDay::Error(), BoxLayoutData< T >::interval(), BoxLayout::isClosed(), LayoutData< T >::m_boxLayout, BoxLayoutData< T >::m_comps, BoxLayoutData< T >::m_isdefined, and BoxLayoutData< T >::setVector(). References BoxLayoutData< T >::allocateGhostVector(), CH_TIME, Copier::clear(), MayDay::Error(), BoxLayout::isClosed(), LayoutData< T >::m_boxLayout, BoxLayoutData< T >::m_comps, LevelData< T >::m_disjointBoxLayout, LevelData< T >::m_exchangeCopier, LevelData< T >::m_ghost, and BoxLayoutData< T >::m_isdefined. Referenced by aliasLevelData(), blockRead(), PetscSolver< T >::computeResidual(), LevelDataOps< T >::create(), PetscSolver< T >::create_mat_vec(), LevelData< T >::degenerate(), BaseLevelHeatSolver< LevelData< FArrayBox >, FluxBox, LevelFluxRegister >::incrementFlux(), and read(). References BoxLayoutData< T >::allocateGhostVector(), CH_TIME, Copier::clear(), LevelData< T >::copyTo(), LayoutData< T >::m_boxLayout, BoxLayoutData< T >::m_comps, LevelData< T >::m_disjointBoxLayout, LevelData< T >::m_exchangeCopier, LevelData< T >::m_ghost, and BoxLayoutData< T >::m_isdefined. References BoxLayoutData< T >::allocateGhostVector(), Interval::begin(), CH_assert, CH_TIME, Copier::clear(), MayDay::Error(), LayoutData< T >::m_boxLayout, BoxLayoutData< T >::m_comps, LevelData< T >::m_disjointBoxLayout, LevelData< T >::m_exchangeCopier, LevelData< T >::m_ghost, BoxLayoutData< T >::m_isdefined, BoxLayoutData< T >::setVector(), and Interval::size(). References LayoutData< T >::box(), LayoutData< T >::boxLayout(), LayoutData< T >::dataIterator(), and LevelData< T >::m_disjointBoxLayout. Referenced by LevelDataOps< T >::assign(), LevelData< T >::copyTo(), LevelData< T >::define(), LevelData< T >::degenerate(), and MergeSolver< T >::solve(). References LayoutData< T >::box(), LayoutData< T >::boxLayout(), LevelData< T >::copyTo(), LayoutData< T >::dataIterator(), MayDay::Error(), LevelData< T >::getBoxes(), LevelData< T >::ghostVect(), LevelData< T >::m_disjointBoxLayout, LevelData< T >::m_ghost, and IntVect::Zero. References CH_TIME, Copier::define(), LevelData< T >::exchange(), Copier::isDefined(), LevelData< T >::m_disjointBoxLayout, LevelData< T >::m_exchangeCopier, and LevelData< T >::m_ghost. Referenced by PetscSolver< T >::computeResidual(). Referenced by aliasLevelData(), blockWrite(), LevelData< T >::copyTo(), LevelDataOps< T >::create(), MergeSolver< T >::solve(), and write(). Referenced by aliasLevelData(), LevelDataOps< T >::create(), ViscousTensorOp::diagonalScale(), NWOViscousTensorOp::diagonalScale(), ViscousTensorOp::divideByIdentityCoef(), NWOViscousTensorOp::divideByIdentityCoef(), LevelDataOps< T >::dotProduct(), BCFunction::fillGhostCells(), LevelDataOps< T >::incr(), LevelDataOps< T >::mDotProduct(), and MergeSolver< T >::solve(). References LayoutData< T >::dataIterator(), BoxLayout::get(), BoxLayoutData< T >::m_comps, LevelData< T >::m_disjointBoxLayout, and LayoutData< T >::m_vector. 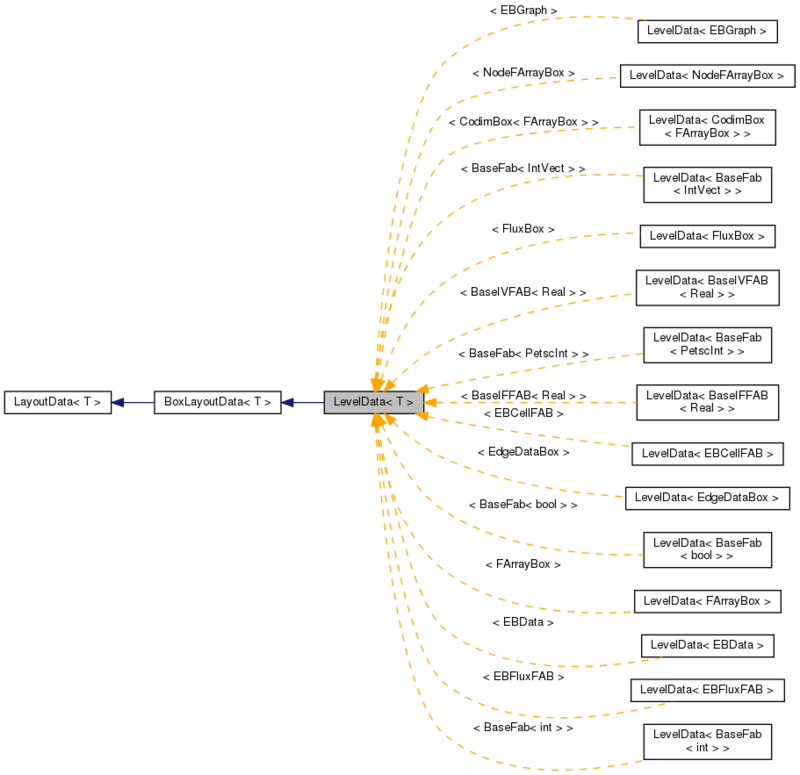 Referenced by LevelData< T >::apply(), LevelData< T >::copyTo(), LevelData< T >::define(), LevelData< T >::degenerate(), LevelData< EBFluxFAB >::disjointBoxLayout(), LevelData< T >::exchange(), and LevelData< EBFluxFAB >::getBoxes(). Referenced by LevelData< T >::copyTo(), LevelData< T >::define(), LevelData< T >::degenerate(), LevelData< T >::exchange(), and LevelData< EBFluxFAB >::ghostVect(). Referenced by LevelData< T >::define(), and LevelData< T >::exchange().